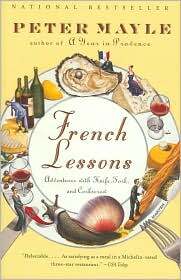 For the past few days, I’ve been salivating my way through French Lessons by Mayle. His book is a delightful culinary romp from one French food festival to another. He intersperses many French expressions in the book and I totally enjoyed my feeble attempts at figuring out what they meant. Reaching way back mentally to my high school French, I surprised myself by remembering more than I imagined I’d ever learned from the rinky-dink black and white film strips about Madame and Monsieur Thibeaux! How proud I felt to know I’d retained the language of amour for thirty plus years. Those French lessons are beginning to look like a reality now. I had a hearty laugh envisioning a church service in Richerenches where once a year, church goers drop truffles in the collection basket passed at Offertory. The valuable truffles are later auctioned off at the truffle festival. Only in France! Another surprise was a specially designed spoon used in France for the collection and consumption of leftover sauce on your plate. What a brilliant idea! I want a set of those. I was fascinated by the connection Mayle made between French food and the French revolution in 1789. He writes that up until that time, only the aristocrats had personal chefs. After their employers met their grisly fates, their chefs opened restaurants and voila – 5 star quality food became readily accessible to the common man. C’est la raison! A reoccurring theme in my summer tour of France is that the French take their food seriously. It is a way of life and one to be savored. Bon Appetit! This entry was posted in Uncategorized and tagged Books, food, France, Mayle, Paris. Bookmark the permalink.